Director Felix Ahrens won a Silver Medal at the Student Academy Awards for this taut mini-thriller. 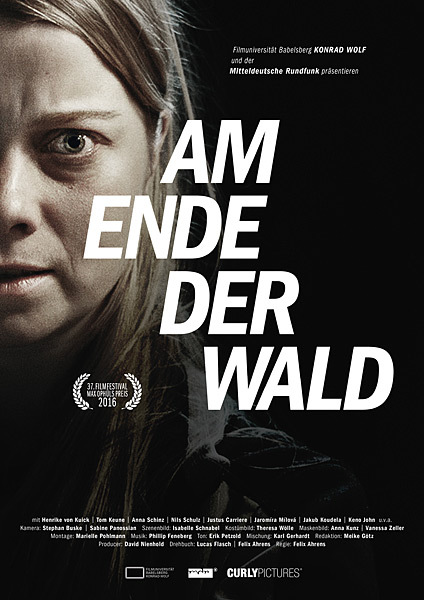 In just 30 minutes, Am Ende der Wald (Where the Woods End) manages to create an unbearable situation for its protagonist, young police officer Elke. While on patrol with her partner near the German-Czech border, she pursues a young man into the woods after a routine pullover. In a moment of panic, she shoots and kills him. The aftermath is quietly devastating as she struggles with opposing feelings of guilt and justification. She’s convinced the man and his accomplice must have been meth dealers or smugglers, but they find no evidence to prove it. In desperation, she takes her own infant son along as she visits the man’s family in the Czech Republic. Her rising guilt and panic collide in a brilliant climax that leaves the audience breathless. As Elke, Henrike von Kuick combines a sense of innocence with deep exhaustion. Her piercing blue eyes look haunted as she carries the burden of her actions. The cinematography is both sweeping and intimate, and the director’s sense of pacing is precise. I suspect it won’t be long before the award-winning Ahrens is directing feature-length thrillers.